Not only do the volunteer members provide financial support for the C Diff Foundation’s programs — it is through their dedication and passion that continuously expands the Foundation’s mission. Some volunteer patient advocates have their own unique C. diff. Survivor Journey which is shared with compassion, dedication, and caring hearts touching patients, students, fellow healthcare professionals, and residents in the community every day. be presented along with numerous Volunteer Patient Advocate certificates for service hours. 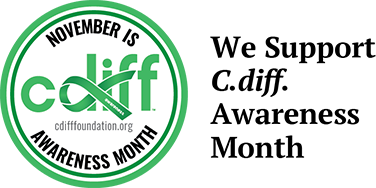 The C Diff Foundation Volunteer Program was organized in 2012 to provide volunteer services, promote community understanding of Clostridium difficile (C. diff.) CDI Infection Prevention, Treatments, Environmental Safety and Support and to raise funds for special C Diff Foundation patient/family programs. U.S. Nationwide information Hot-Line (1-844-FOR-CDIF) to support health care providers, patients, and families guiding them through the difficulties caused by a C. diff. infection. program,C. diff. Spores and More which broadcasts live every Tuesday at 1:00 p.m. EST. We are grateful for our sponsor Clorox Healthcare for making this program possible. Each episode becomes a podcast and is accessible from the C. diff. Spores and More living library located on the main cdiffradio.com program page. Each November the Volunteer Members gather at the annual conference to both present and provide assistance in making the attendees feel welcome and expand their knowledge base on a variety of health topics that are linked to the main topic ~ Clostridium difficile infections. C Diff Foundation Volunteers — Helping Us Help Others and The Beacon Of Light On the Other Side Of Pain and Suffering.